BabyBoardy Blog: Well... that confirms it! As our trip progressed, Naomi had a inkling, a bit of a feeling, that our absence of 'precautions' had already taken effect. 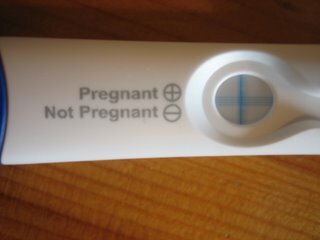 So, we thought we'd grab a pregnancy test kit and check it out. The first one we got (in London) came out positive. But the kit itself was a little on the dodgy side, (and Nai was a bit pissed when she used it, so initially held it face down) so we thought we'd give it another go. Now... you'd have to assume that the test kits you buy in Dublin would have to be pretty good quality (and quite hot-sellers I'd expect!) So... with our second (and pretty obviously) positive result, we were happy that Nai had better restrict her Guinness intake!